Fly like an eagle to the sea of Bald Eagle stuffed animals! These stuffed Bald Eagles and plush Bald Eagles are proud to represent the United States as it's official national bird. More importantly, they're ready to spread their wings and fly to your home. Normally a Bald Eagle makes a huge nest but these stuffed Bald Eagles are perfectly happy nesting right in your bed, or on a shelf, or even the floor. Plush Bald Eagles just aren't picky when it comes to nesting as long as their owner loves them. 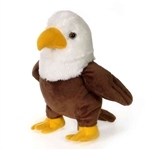 A Bald Eagle stuffed animal can be a great way to show school spirit unless your school mascot isn't a Bald Eagle. In that case you probably need to look at some of our other stuffed animals to show your school support. 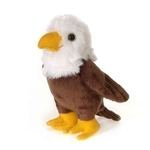 Some of our plush Bald Eagles are posed perfectly for displaying, like the giant forty-eight inch stuffed Bald Eagle by Fiesta or the realistic plush Bald Eagles by SOS. They are wonderful looking stuffed animals that make great conversation pieces. Whatever you intend to do with your new stuffed bald eagle we're sure to have one just for you!